Home Care Solutions You have a parent or family member who has a zest for life - but they still have an undeniable need for assistance with everyday activities. They deserve more, but unfortunately the help you wish you could personally provide is simply out of the question. Family Private Care is proud to refer competent, affordable caregivers who provide specialized home-care services. Caregivers who are trustworthy. Reliable. Caring. Just like family. Performing other cleaning tasks as requested by client Whether it's a disability, a little fragileness, or simply a need of support to sustain independence or safety, call 800.962.0884. 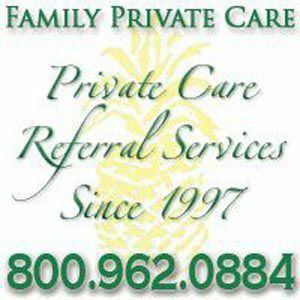 Family Private Care will make certain that you or your loved one receive compassionate, affordable, and reliable care.